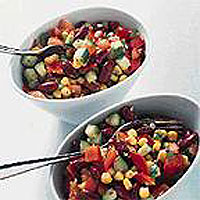 Whisk the dressing ingredients together and pour into a large salad bowl. Prepare the salsa ingredients and toss in the dressing. Leave to stand for one hour to allow the flavours to develop. Sharp knife, chopping board, garlic crusher, small mixing bowl, whisk, teaspoon and tablespoon.